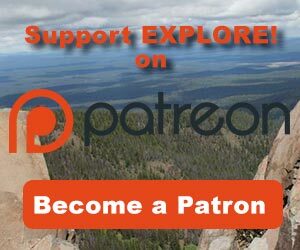 Climbing Aspen Butte - Explore! Climbing Aspen Butte - Explore! 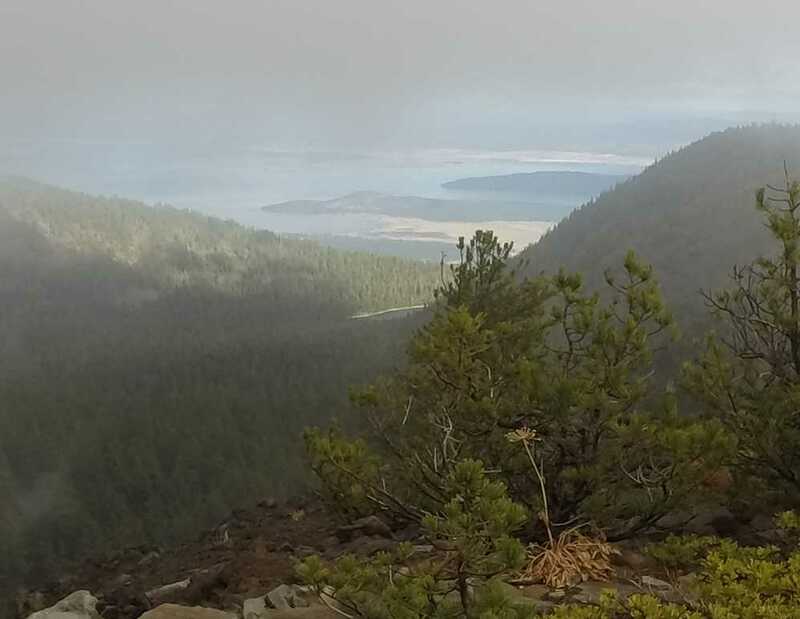 Predictions of snow and rain led the Klamath Basin Outdoor Group to cancel a planned backpacking excursion into the Mountain Lakes Wilderness. 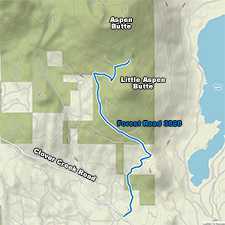 Instead they decided upon a day hike to the top of Aspen Butte (42°18′56″N 122°05′15″W). The plan was to follow a route no one in the group, except your Pathfinder, had followed before. This is the story of that adventure, but first a little background. 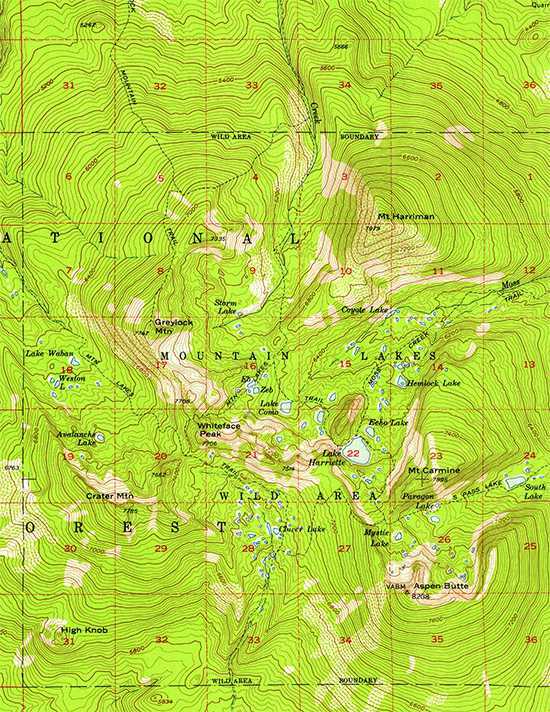 Four overlapping stratovolcanoes once stood at the center of the Mountain Lakes Wilderness. They began forming more than 3.6 million years ago1. 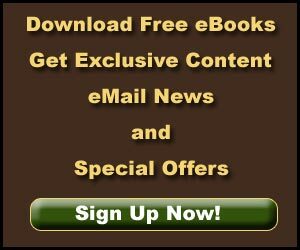 They last erupted more than 500,000 years ago. Since then they have been battered by ice and eroded by water. After eons of scouring, these mountains were left with huge cirques carved out of their sides. Much of the material that moved down the mountains came to rest in the valley floor between the mountains. 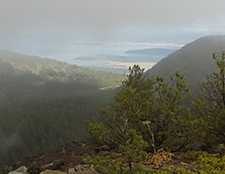 All that remain of these mountains form the rim around the Mountain lakes Wilderness. Aspen Butte at 8,215 feet (2,504 m) is the tallest of these remnants. 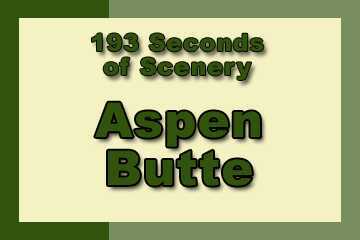 Just south of Aspen Butte, and outside the Wilderness, is Little Aspen Butte at 7,235 feet (2,205 m) . It is a satellite cone that is separated from Aspen Butte by a saddle at about 6,556-feet (1,998 m). The most popular trails into the Mountain Lakes Wilderness are the Varney Creek Trail and the Clover Creek Trail. The Varney Creek Trailhead is located on the north side of the Wilderness. 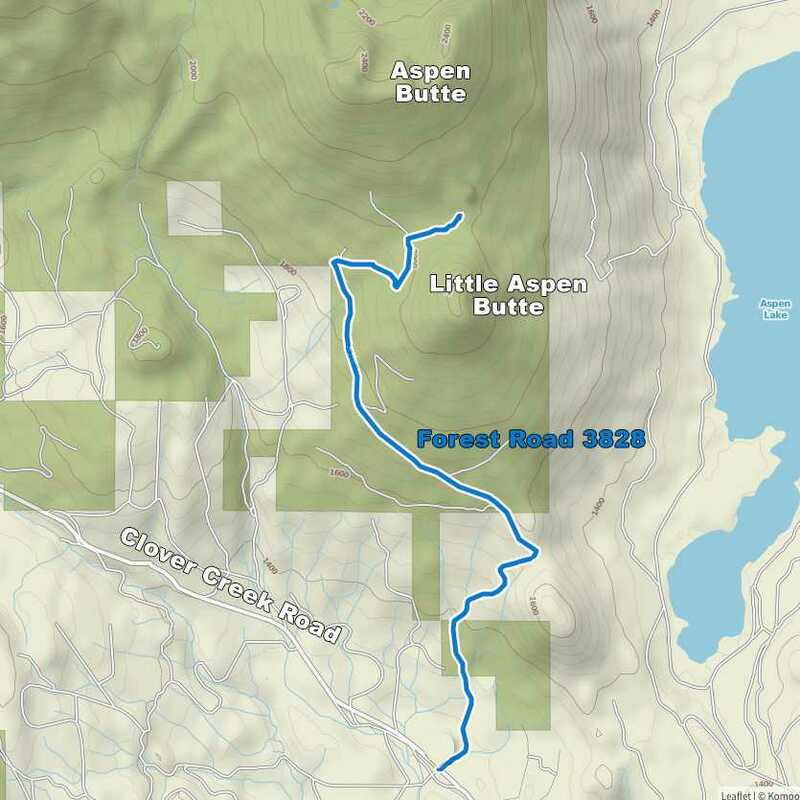 To get to the top of Aspen Butte, one would need to follow Varney Creek Trail to the Mountain Lakes Loop Trail, then southwest along the trail, up the ridge to Whiteface Peak then eastward to a point just before the trail drops back down the ridge. From there follow the ridgeline upward to the summit of Aspen Butte. A shorter route enters the south side of the Wilderness on the Clover Creek Trail. The trail meets the Mountain Lake Loop trail just southeast of Whiteface Peak. From there, the above instructions apply. Our alternative route is much shorter and steeper than the aforementioned alternatives, unfortunately there is no trail. The Butte is accessed from Forest Road 3828 that leaves the Clover Creek Road at it’s intersection with the Spencer Creek Hook-Up Road. Road 3828 winds its way up to the saddle between Little Aspen and Aspen Buttes as shown on the map to the right (click the map for a larger version). From the saddle it’s less than a two mile walk, as the crow flies, to the summit. Of course there is a climb of over 1,600 feet, lots of large down trees and boulder fields so we didn’t travel as the crow flies. Before we started up the mountain a couple of us took GPS readings on the vehicles. When coming back down the mountain it is surprisingly easy to hit the road upon which the cars are parked without knowing which way to the cars. In addition, there are some other old logging roads around that can lead to confusion. We didn’t bother with entering GPS coordinates of the peak into our units simply because it’s mostly a matter of going uphill. While we couldn’t see the peak of Aspen Butte through the trees, we knew that, when we left the vehicles, it was northerly and straight uphill. There is also a long ridge that runs east and west from Aspen Butte with a near vertical face on its north side. We didn’t plan to reach the peak directly, but rather to reach the ridge then follow it the remainder of the way to the top. As long as we headed uphill we knew it would be very hard to miss the ridge. Bushwhacking is one of those things that is both an art and a science. The science tells us the general terrain and our destination. The art comes in finding a route that gets around most of the large down trees (it takes a lot of energy and care to climb over these huge, branch-covered tree trunks) and avoids the boulder fields. Sometimes boulder fields are preferable to brush, but there really isn’t much heavy brush to deal with on this route. Avoiding boulder fields often means avoiding twisted ankles and other bodily damage. 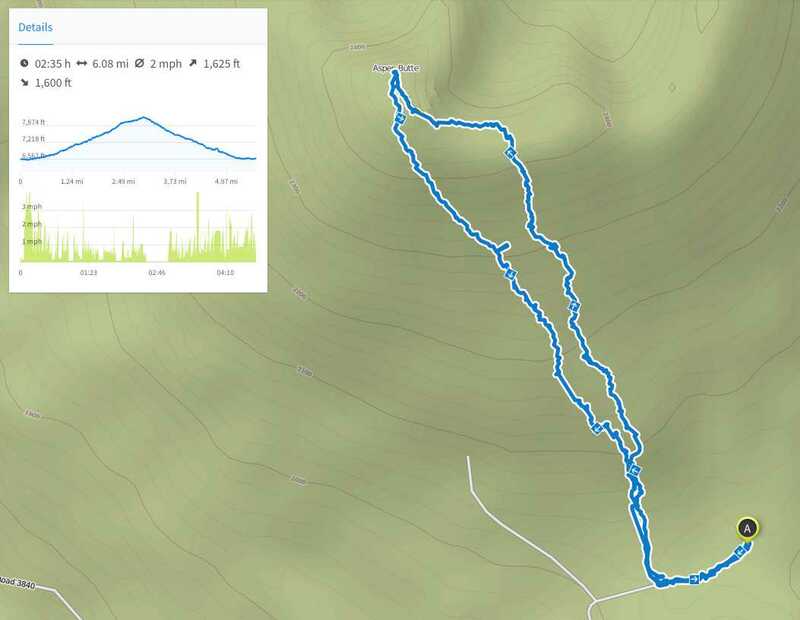 The result of bushwhacking was the route shown above (click the map for a larger version). As you can see by the statistics shown on the map, our two-mile walk, as the crow files, was more like three miles given our chosen route. Note that the time shown is the moving time and we took some rest stops. Rather than wandering along the ridge to the east and trying to follow the same route down the mountain, we simply headed down from the summit, knowing we needed to travel toward the east to get back to our original route. Since the vehicles were a much smaller target than the ridge line, we used our GPS units to gradually bring ourselves back to where we needed to be. The day of our adventure was cool and windy with threatening rain that never developed. As we climbed the mountain, the clouds seem to rise just ahead of us. When we reached the peak the clouds were racing by below us and eventually climbed to eye level and higher as we ate lunch. 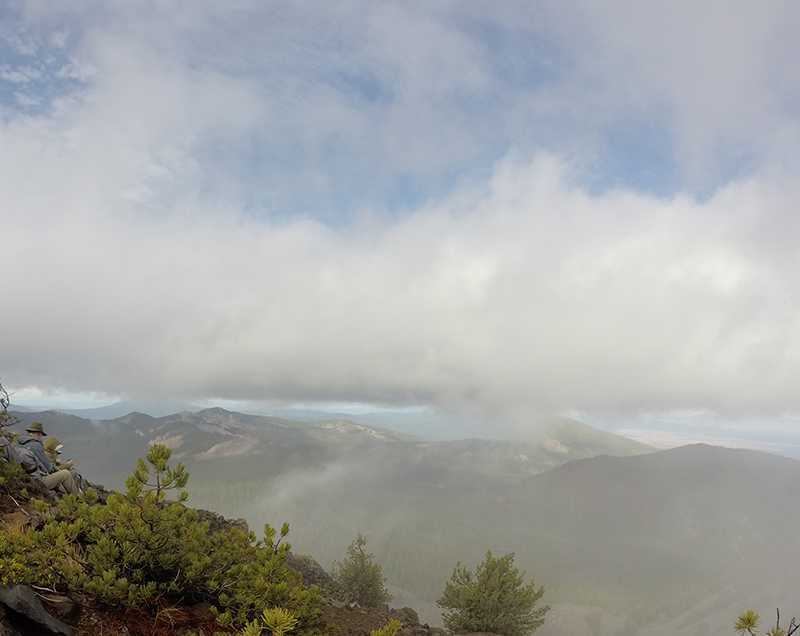 The top of Mt McLaughlin is obscured by the clouds, but some of the closer peaks and the valley of Mountain Lakes can be seen. You can find a larger version of the video on our YouTube Channel. Carver, G. A., 1972, Glacial geology of the Mountain Lakes Wilderness and adjacent parts of the Cascade Range, Oregon. Seattle, University of Washington, Ph. D. thesis, 75 p.
All the photos and video were shot and processed by Jerry Haugen Pathfinder. The text (except as otherwise credited) was also written by Jerry Haugen, Pathfinder. The small road and trail maps were derived from materials produced by the Komoot iPhone application and modified for use here. All materials are ©2015 Global Creations LLC, All Rights Reserved. The soundtrack music is The Rainy Season by David Hamburger published by Stacktraxx Music and used under license. The USGS map below shows the Mountain Lakes Wilderness and its trails as of 1955. Some of the trails (particularly the Varney Creek Trail and the Mountain Lakes Loop Trail) have been relocated and some of the trails that are still in use are not shown on newer maps. Plus, the older USGS quadrangle maps, like this one, show sections that are one-mile square, making navigation a bit easier. Click the map for a larger version.